A pull-off is done by playing a fretted note and then lifting your fretting finger up, with a sort of sideways plucking motion, which creates a second note. It is sort of the reverse of a hammer-on. Pull offs on the first string are generally "pulled" in the direction of the floor--that is, towards the left hand palm. Pull-offs on the other strings are generally done by "pushing off" in an upwards motion--extending your fretting finger. A pull-off can be done to an open string or to a fretted note below it. The first example pulls off to an open 1st string. 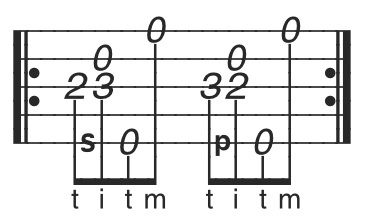 The second one pulls-off (pushes) off with the middle left hand finger while the index left hand finger holds the fretted note below it. Important: When playing 3-2 pull-off above, begin by placing the index finger on the 2nd fret AND the middle finger on the 3rd fret. You need both fingers solidly placed on both notes BEFORE you pull-off (pluck) with the middle finger. Pull-Off Exercise (MP3 Track 22) This next example pulls off from the 3rd fret to the second fret. Again, notice that it takes two fingers of the left hand to create a pull off to a fretted note. 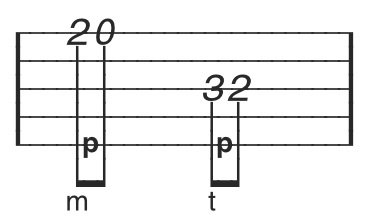 In this example the higher first note is fretted with the middle finger and the lower second note is held down in advance by the index finger. The first half of this exercise uses the "slide roll" lick you learned earlier. Here is a variation of the second half of Cripple Creek which uses a pull-off in the third measure. Obviously, using the pull-off is optional. This minor change illustrates one the many possible ways one can embellish a tune. 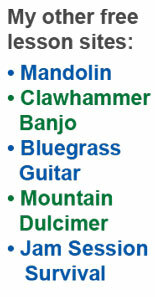 This is a great exercise since it includes the BIG THREE types of bluegrass banjo embellishments: slides, hammer-ons, and pull-offs. You could also insert the pull-off lick in other places. For example, I often play the first measure just like measure 3. For your listening enjoyment... This is just me playing the tune at a little faster speed along with a guitar. In case you are wondering, I begin by playing the B part once and then AABB over and over. This demonstrates how all these (and a few more) licks can be scrambled to make the song more interesting. Lots of pull-offs in action in the B parts. I am rollin' now... let's go to Lesson 14.